With a wide range available on the market it can be tough to know which is the best pop filter choice for your Blue Yeti Microphone. Anyone who has recorded with a studio mic in the past will understand the issues that arise without using a pop filter. Like undesirable peaks in levels from hard consonant sounds like 'T' and 'B' that are unavoidable will ruin even the best take. Blue Yeti microphones are among some of the most sensitive on the market. They generate an immaculate, crisp rendition. 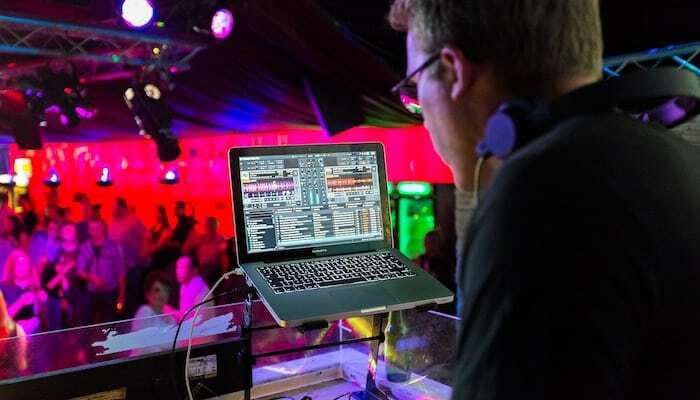 This means that whilst they are a superb choice for audio production they inevitably pick up on the ambiance of the surroundings with a high degree of accuracy. Perfect for pristine vocals but only with an essential filter. There are many factors to take into account when selecting a suitable pop filter. Do you need a Pop Filter For Blue Yeti? What Foam Pop Filter For A Blue Yeti Mic? We have compiled a list of our top ten products to assist you in picking something ideal. Read on further for the full buying guide! Foam perfectly fits the over product giving more protection. Simple to use, slip on and go no assembly required. Made from a high quality long-lasting foam. Flexible but sturdy, fully adjustable gooseneck holder. Effective double woven composition for high quality sound. Easy to use secure clamping system. Stylish design and color options. This foam windscreen is specifically designed for use with a Blue Yeti mic. Needless to say it is a top contender when looking for the best pop filter for your new best-selling USB condenser microphone. 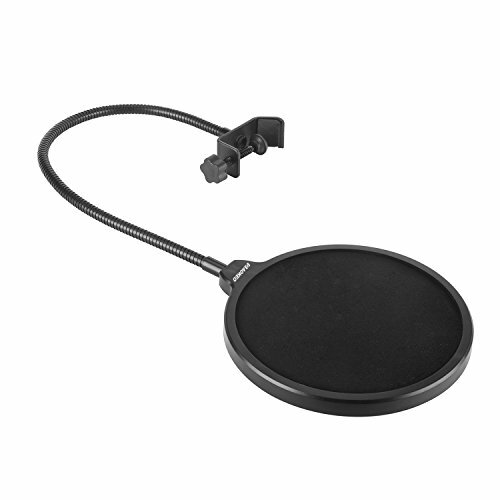 This wind screen pop filter also fits other large top microphones on the market as well. In comparison to typical pop filters shields this pop screen, as its name suggests, will help reduce the harsh sound of wind gusts. This high degree of protection aimed at outdoor use makes a huge difference in an ordinary indoor home studio set-up. Powerfully minimizing a diversity of unwanted background noises. The foam windscreen for Blue Yeti mics effortlessly stretches over the microphone in its entirety. This means all angles are covered. 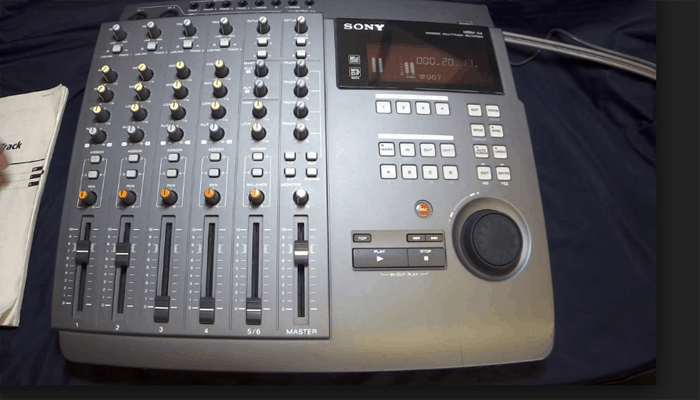 At a retail price of $12.95, it is a sound investment towards producing professional tracks. + Foam perfectly fits the over product giving more protection. + Simple to use, slip on and go no assembly required. + Made from a high quality long-lasting foam. A simple to use clip-on style pop filter shield. This budget pop filter mimics all the features found in typical high-end studio pop filter designs. It has been constructed with a dual layer of woven nylon mesh, which softens the force of the vocals thrown into it, deadening pops. 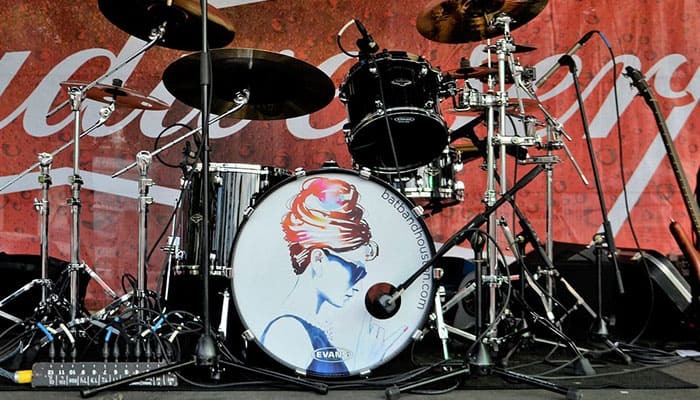 The standard circular shield concept has been tried and tested throughout the music industry. Proven to aid in the creation of professional level recordings. 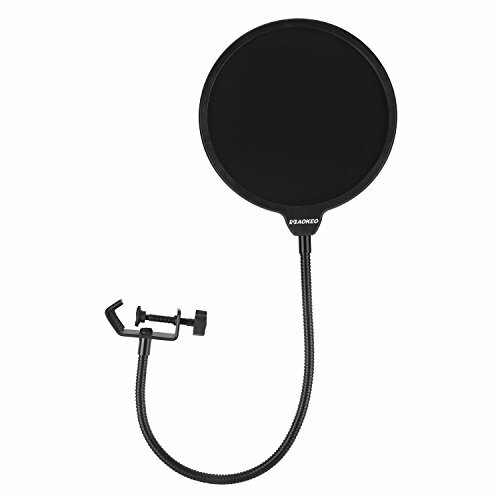 The budget pop filter shield is capable of stopping harsh plosive popping sounds associated with strong consonants and directional microphones to ensure a high quality end result. It has an adjustable neck which can be twisted any direction and a clip attachment making it compatible with a whole host of studio set-ups and a variety products not just your Blue Yeti mic. 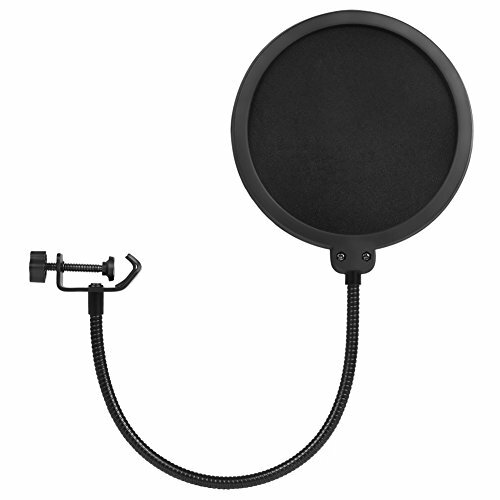 The budget pop filter itself measures six inches in diameter, so is ideal for using in compact spaces. Its price, $9.99 makes it a low-cost addition to get that sought after pro sound. + Flexible but sturdy, fully adjustable gooseneck holder. + Effective double woven composition for high quality sound. + Easy to use secure clamping system. Why We Liked It - It is an inexpensive reproduction of well-established product that successfully emulates the qualities found in higher end models. Whilst this 6-inch Auphonix pop filter is suitable for most USB desktop mics it has been designed with the Blue Yeti in mind. Unlike most pop shields, which fix to the boom arm or Blue Yeti microphone stand it will clap directly to your studio mic itself without the risk of damage. It too features a double mesh pop screen giving sufficient protection against high impact sound delivery, which results in flawed vocal recording. This Auphonix 6-inch pop screen expertly reduces distortion and softens background elements within recording locations. The gooseneck style holder Auphonix flat clamp simply and capably supports the weight of the shield. 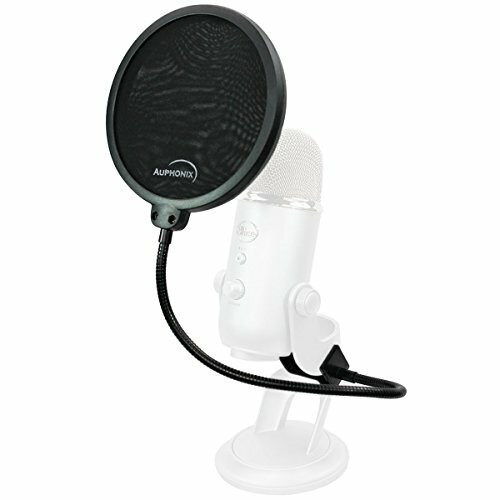 The Auphonix pop filter holds firmly in position once it has been bent and adjusted to where you desire it. 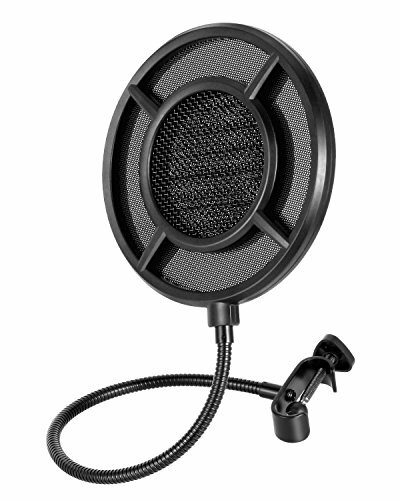 At around $18.97 this Auphonix 6-inch pop filter is a little pricier than the first two products but incorporates some neat attributes specific to use with your Blue Yeti (or Yeti Pro) microphone or a USB desktop mic that are worth the increase. + Pliable but supportive neck. + Stylish design and color options. Why We Liked It - The way it fixes has been contemplated on. It is clear this filter has actually been fabricated primarily for the Blue Yeti Microphone. 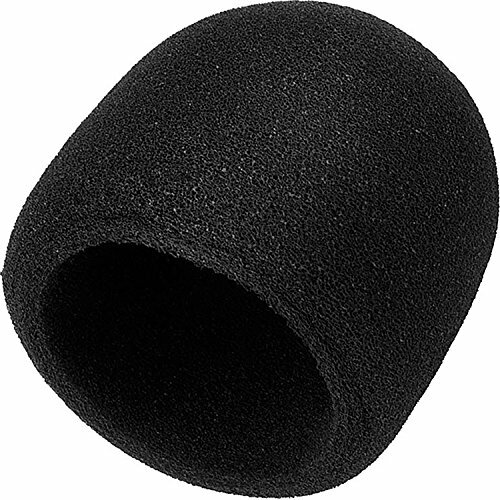 This foam cover retains it shape and slips snugly over the microphone. It is the correct size for Blue Yeti and Yeti Pro mics. It prevents unwanted interference from wind and plosive frequencies that spoil recording vocals. The Mudder mic cover envelops the whole microphone head serving as a protective barrier between mouth and mic. This keeps long term damage, like the buildup of mold from exposure to saliva minimal. This Mudder mic cover requires less time and effort than setting up a typical shield type pop filter and occupies far less space as well. Ideal for VOIP, live podcast hosting as well as music and audio production. The products primary function is to improve recording quality and counter the need for lengthy post editing. It looks like a promising option and is undoubtedly a steal for the low price of $6.99. + Doesn't get in the way like a pop shield attachment can. + Dulls the effect high impact interference and drowns out the wind. Why We Liked It - The value for money is unbeatable. They are providing a simple solution for recording quality improvement. Another Dual layer, circular clip-on pop shield. This filter attaches with an adjustable rotating screw clamp, so can be affixed to a variety of boom stands and mic stands. The dual layer serves to firstly protect against forceful air which can distort audio productions. Secondly it helps to disperse the air within the second layer with the goal of diminishing the strength of what hits the microphone. It has a sturdy neck and is easy to manipulate to precisely where required. Once placed it retains its position. The shield is less bulky and light-weight, as it has been manufactured solely from fabric differing from similar products which often contain an outer frame. At a competitive $6.99 it is a cost effective asset to improve your home recording abilities. + Scratch proof gripper on the clamp to prevent damage to boom stands. + Double layer system guarantees less hisses and plosives. Why We Liked It - It promises to reduce sibilant noise and pops on recordings and is suitable for broadcasting. This pop filter cover has a distinct aesthetically pleasing look imitating other more expensive arch shaped filter products on the market. It features a unique triple layer shield comprised of foam, metal and etamine. The layers work together to form a dynamite barrier. It adeptly protects against plosives, hisses, wind interference, audible breath sounds on high and low frequencies. Its semicircular form and composite nature eliminates corrosion from saliva and debris. The Swyon Metal Mesh mic cover accommodates a variety of column shaped microphones, importantly the Blue Yeti. It mounts easily and contains rubber band to help shock absorb during the recording process. It assures a professional level of sound recording with little need for noise reduction in the post production phase. Available for the price of $8.59 it is a stylish heavy-duty option for noise cancellation and audio improvement. + Not as expensive as counterparts. + Triple player process for extra security. Why We Liked It - The sponge product is removable and washable eradicating germ growth and stretching overall life spans of your microphone. It has a high build quality, too! 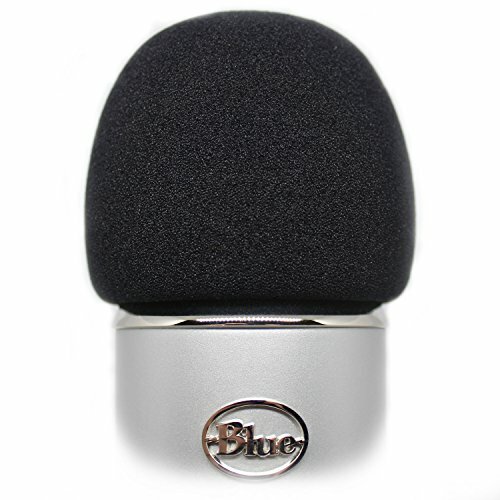 A mid-range wind shield cover which once again has been designed exclusively for use with Blue Yeti mics and other microphones on the market with similar dimensions. This mic cover provides full mic head coverage to extend the overall life of your studio microphone combatting external dust and saliva from gathering in the equipment. Made from a spongy material that is breathable but adequately safeguards from environmental interruptions. It is straightforward to use and achieves a high quality audio finish neutralizing unnecessary noise. It superbly minimizes hard consonant sounds like 'D ' and 'P' from causing troublesome popping throughout recordings and lowers breaths as well as hisses. It retails for around $7.99, presenting another affordable choice of audio enhancement accessory. + Prevents interference without sacrificing subtle tonality. + Made from a high quality sponge material. + Easily applied with a circular hand motion. + Helps to protect against corrosion. The screw-up clamp of the Knox pop filter has been thoughtfully adapted to fit the non-traditional base design of the Blue Yeti mic. Instead of being curved it is flattened to allow the mic to sit comfortably against the microphone. It has a protective cover on both sides so as not to leave scratches. It has a 6-inch diameter giving a good area of coverage. 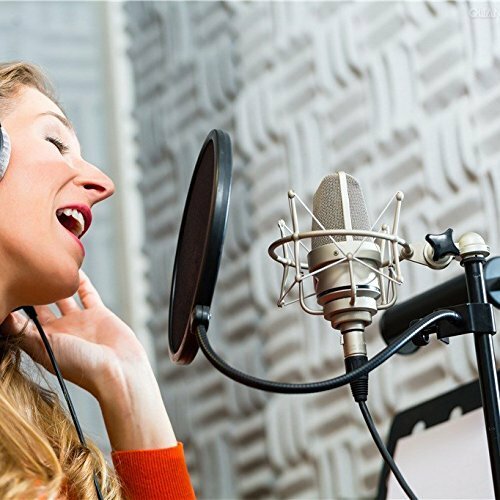 It helps to refine vocal inputs to a clear quality, canceling out large bursts of air that hit too hard into the studio microphone causing unprofessional pops and hisses. 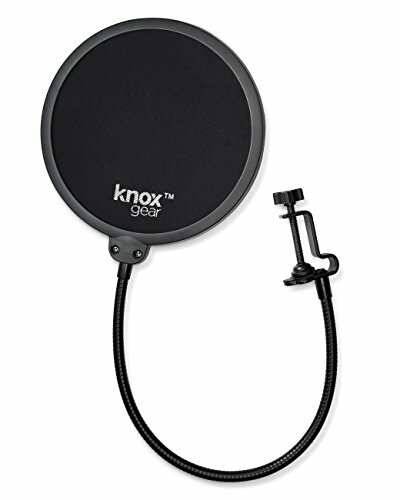 This Knox pop filter is mounted on a flexible gooseneck arm that allows for favorable placement of the shield. It is a little pricier, coming in at $19.99 but offers intelligent adaptations within the conceptual design of the clip making it perfect for use with the Blue Yeti microphone. + Clips to Blue Yeti mic. + Provides a guard against saliva. Why We Liked It - It is another product, which demonstrates its concrete suitability for the Blue Yeti mic. This Blue Yeti pop filter has a professional appearance. SOONHUA have opted for a dual layer mesh similar to other shields but in metal rather than fabric. Using a stronger material than tradition filters helps to further drown out background noises. The circular shield is split and divided into one central area and 4 outer parts adding to its noise diffusing abilities. It reportedly culls hard and guttural pops, hisses and excessive breath sounds, culminating in crisp audio recordings. The SOONHUA pop filter is a smart choice if you are trying to escape hours of tiresome processing. The clamp design again is suited to attach to the Blue Yeti base but can also be placed on boom arms and onstage stands, which are less than 1.02 inches thick. It is idiot proof to set up Clamp and swivel mount the tensile arm and press record. 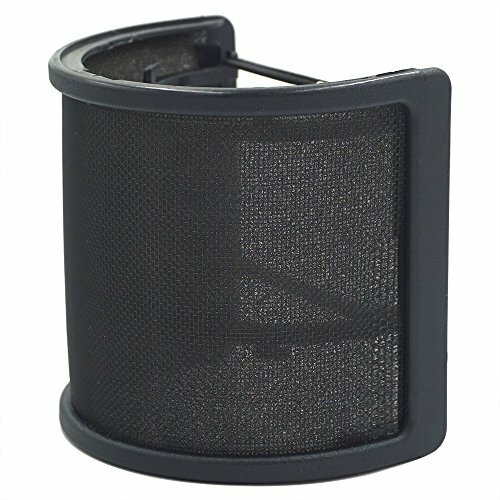 At a modest $15.99 it is another great choice for your pop filtering needs. + Aimed at professional level studio set-ups so will give amateurs an edge. + Smart frame design features. + Suited for blue Yeti bases. Why We Liked It - The material choice offers a stronger defense against pops. This double layered universal pop filter has a 360 degree swivel neck allowing the angle to be adjusted freely whilst keeping it firmly in place. The clamp makes it suitable for use in a wide range of ways. The dual mesh functions in a manner expected from other industry standard filters. First cushioning the blow of words expelled to quickly or hardened letter phonetics such as 'P', 'T', and 'D' which can cause an unpleasant thudding sound in recordings. It then disseminates the sound wave whilst it is traveling between the two layers allowing a softer, clearer, more balanced sound to travel through to the studio microphone. This pop filter costs just $6.99. + Universal pop filter clamp. + Double layered mesh to help filter thoroughly. Why We Liked It - This universal pop filter is fit for purpose and has a broad adjust ability. There are different schools of though on the subject what you need to take into account its intended use. Are you singing, speaking, or recording a musical instrument? Is it for live broadcasting use? Maybe you need something, which strongly filters as you go, as post editing is not an option. Will you be interviewing? If so, you will likely need something with permanent large coverage or you will have to sit uncomfortably close together to share the microphone. Next you need to consider your desired outcome. How pristine do you want your audio files to sound? Are you a budding artist trying to compete to get your song heard by industry legends? Or would the natural ambiance of the crickets chirping compliment your documentary narration. 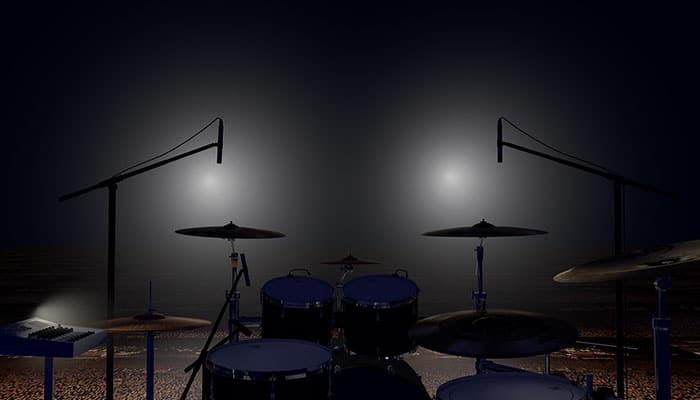 Mesh pop shield style filters offer a double, sometimes even triple point system, of managing sound. It is a systematically proven sound quality enhancing technique. I will explain a little more of the science behind the concept in the following section. If you have any inclination to use your studio mic outdoors you will need the foam to counter wind interference, which can change direction at a moments notice. Please read on for a more detailed explanation of what to look for in a foam filter. A pop filter is an object placed between the speaker or singer and a studio microphone. Used extensively within the recording industry, things are rarely captured these days on microphones without some sort of pop shield or studio mic cover. Pop-shields, named after the popping spikes in sound, which they were made to thwart they typically feature multiple layers, which the sound wave is, forced to travel through before reaching the mic. This very effectively absorbs the shock of the initial wave hitting the pop filter and defending the microphone. For a minute fraction of a second the sound is trapped between the two surfaces coercing the wave to spread out and disperse. This means further away sounds in the room are less likely to filter through to the recordings. As previously mentioned there are several letters in the alphabet who are the culprits responsible for producing these undesirable popping sounds; B, C, D, G, K, P, Q, and T are letters we produce with strong emphasis that can't really be softened sufficiently in a natural manner. S can also be an incredibly problematic sound producing a high frequency hiss, which is known as sibilant noise. 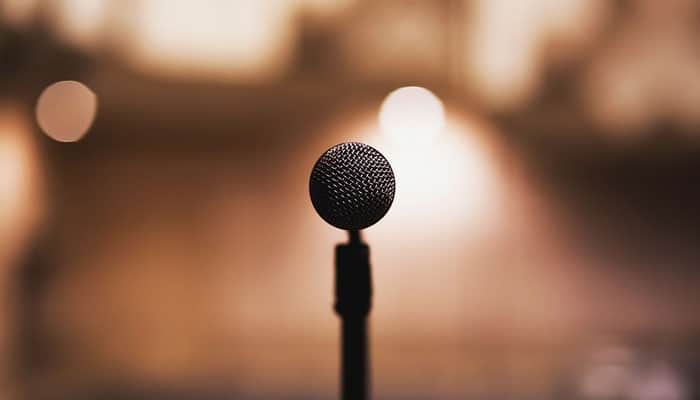 It is a sound that is apparent in those with lisps but microphones detect such subtle changes in the space around them they can give lisps to the most eloquent speakers. So unless we want to tax our brains writing scripts and songs that contain none of the above letters our recordings are likely going to suffer in quality. 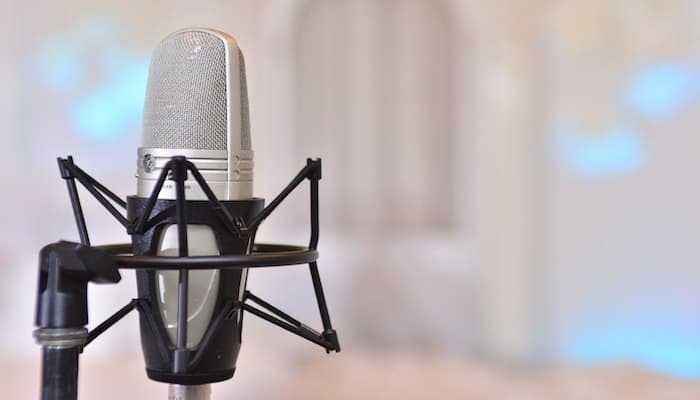 With the development of cutting edge recording technology constantly evolving and improving, professional levels of microphone are becoming lower priced and available on a lower budget. 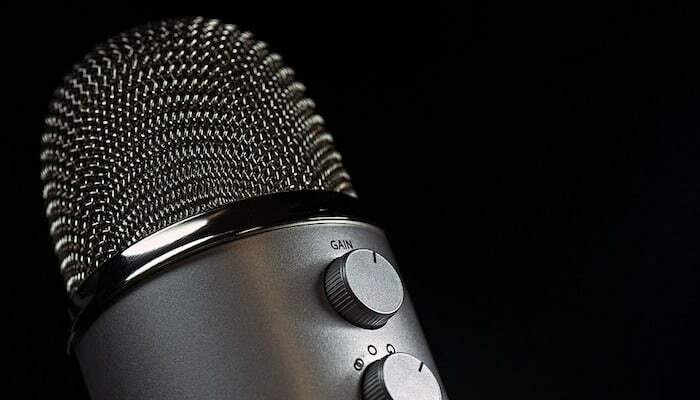 The Blue Yeti microphone is a superb example of this with its four unique pattern settings and Tri-Capsule recording technology; it captures a clear recording with a professional degree of accuracy. It has a frequency response of between 20HZ and 20kHZ so it responds very quickly and picks up a range of low and high-end sounds. 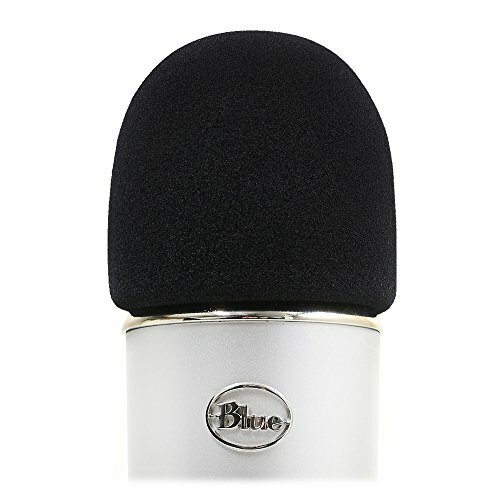 When using a sensitive microphone such as the Blue Yeti model it becomes increasingly prudent to put something into place to ensure you are only recording what you intend to capture, and that you are deadening plosive popping sounds, as the level of distortion will be higher than a recording with a cheap lapel or mobile phone mic. 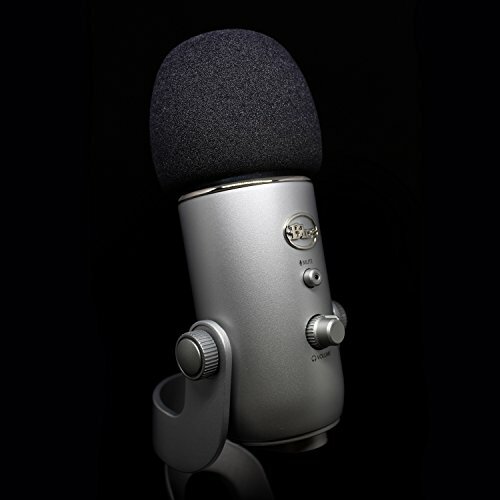 The Blue Yeti mic has been fabricated to provide an expert level of sound quality to the masses. 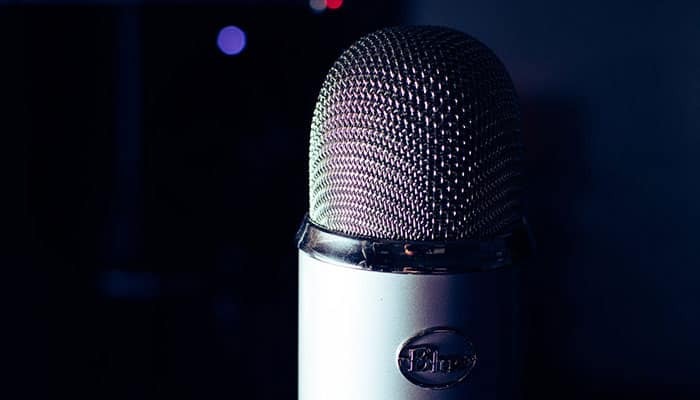 After purchasing a product that offers such abilities and the opportunity to create professional sounding recordings, you would be doing yourself an injustice not to get a Blue Yeti pop filter. If you decide to go with foam as opposed to a fabric or metal mesh you want to make sure it is sponge-like and airy. Denser foams have the tendency to obscure the sound somewhat. They can make the volume level received by the mic lower, requiring more gain which can lead to feedback issues and distortions again. Something lighter weight and breathable is preferable. 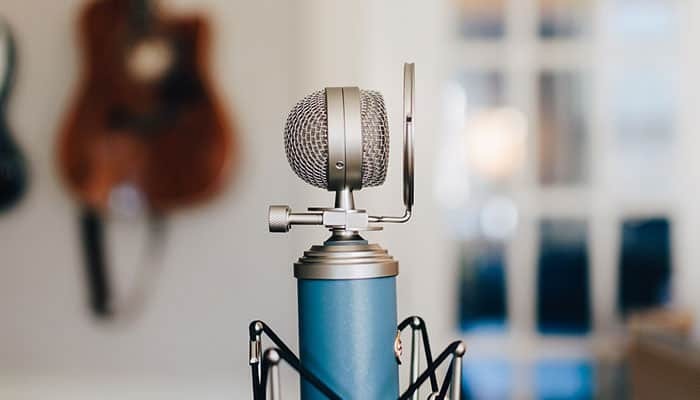 The Blue Yeti is an unparalleled USB microphone with patterns to choose from suited to different recording tasks that would be a benefit you would lose with too much filtering before initial capture. Purchasing a Pop filter for your Blue Yeti mic that you are happy with boils down to a number of important factors. Most of us are striving for better sounding production so undoubtedly we are going to have a few obstacles to overcome. For instance unavoidable outside influences like shirt rustling, wind blowing, and becoming ever so slightly out of breath during that last segment. 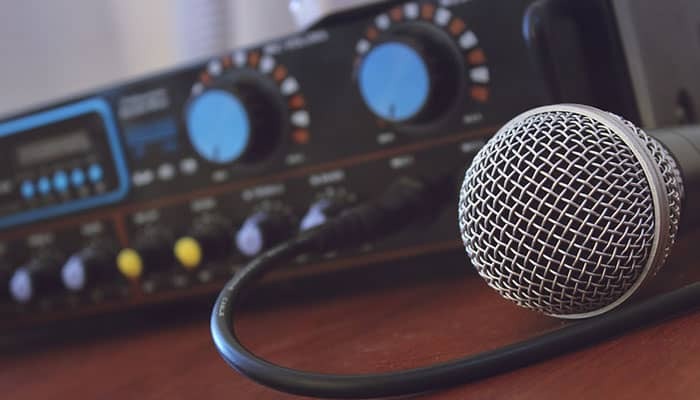 Understanding the importance and challenge of preventing and canceling out background distractions is just the first step to perfecting our recording skills. With so many choices for fewer than 25 bucks, you would be mad not to explore a few options if you are serious about your sound. 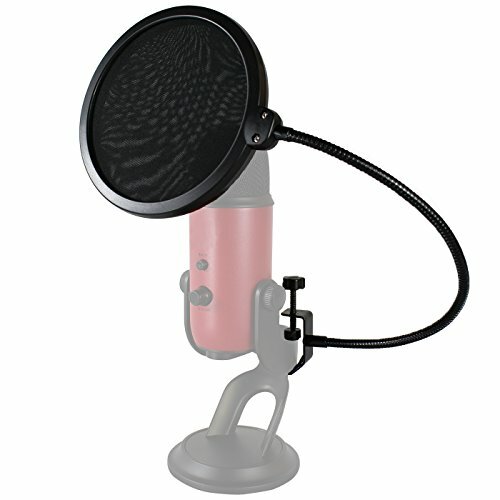 Ultimately deciding which is the best pop filter for a Blue Yeti mic (or any other mic for that matter) will be left to individual preference but one thing is for sure if you want your audience to enjoy listening a pop filter of some sort is an essential item for clear professional audio production. 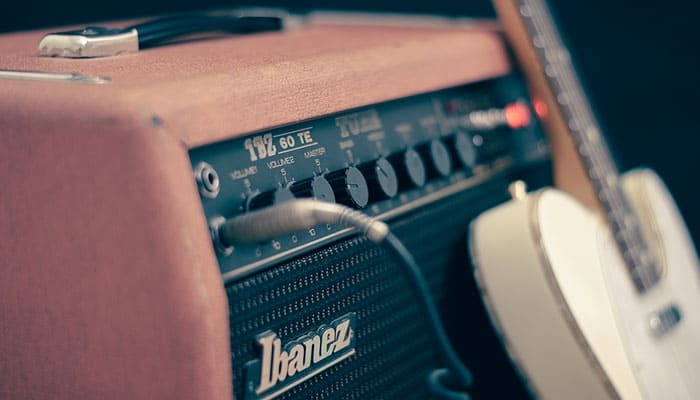 Some studios set-ups incorporate both sponge/foam mic covers along with standard pop shields for optimal filtering, however, they typically use very high-end condenser mics with the top of the range accurate pickups, so are able to maintain clarity without muffling. In a pinch, you can knock up a DIY pop filter shield with a wire coat hanger and a pair of thick, denier tights. It certainly won’t give you an ideal audio finish but perhaps, it could give you an idea of how much a pop shield can enhance recording outputs. A manufactured pop shield will obviously improve tenfold but it is one way to sort of try before you buy! 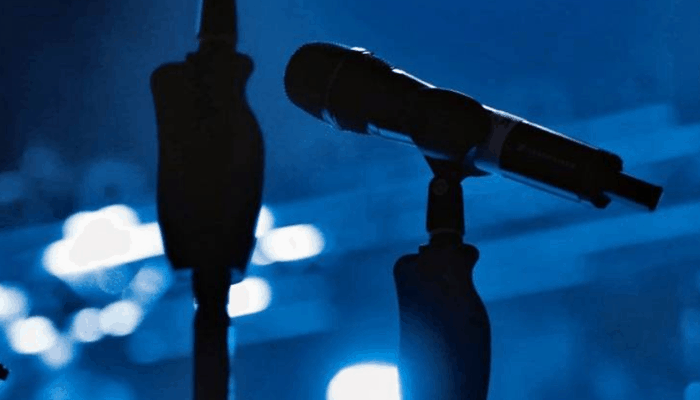 Read more microphone basics here.